The list of developers on that page will grow as we get around to filling in our paperwork. There is also a happy "egg" logo next to our project as we are currently "in incubation". Our mentors for this process are Benjamin Cabe and Wayne Beaton. A big thanks to the uDig team, the helpful people on the location-tech email list, and the Eclipse staff who helped make this happen. 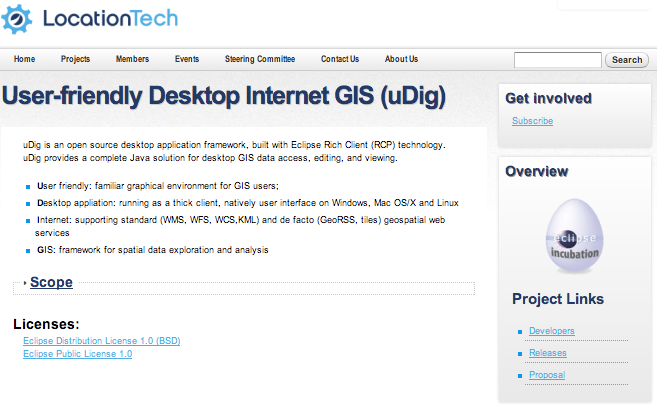 LocationTech is the Eclipse Foundation industry working group for "location aware" technologies. It is a great fit for the uDig project with our technology stack being based on Eclipse RCP. The Eclipse Foundation is a vendor neutral, member support non-profit Foundation. We look forward to participating, making friends in the Eclipse community and joining in LocationTech's out reach to industry. The uDig team is busy filling in the paperwork to access LocationTech facilities, and will be migrating the codebase shortly. One of the initial benefits is access to the Eclipse Foundation intellectual property services. While we are confident our codebase is in good shape, the review by the independent IP team is an important step for the uDig project. The costs associated with intellectual property services is a prohibitive constraint on the adoption of open source in general. The completion of this review for the uDig project lowers risk for everyone involved and makes the project easier to deploy. We have also enjoyed taking part in the LocationTech industry out reach including a recent video presentation on uDig by Jody Garnett and Frank Gasdorf. While we wait the team will continue working on the 1.4.0 release which will be our last release under the Refractions banner. If you would like a sneak peak, the documentation is online, including the What is New page.